In a couple weeks my uncle is getting married. That means i’ll being going to a semi-formal event and need to wear a semi-formal dress. I’ve made a few of those before but they all either obnoxious, too formal, or white, which wouldn’t be very appropriate! I could have bought a dress, but for the first time in forever I had the opportunity to make a dress and actually wear it somewhere, and I felt like I owed it to myself to do just that. I bought the fabrics before I had a design in mind. I had fifty percent off coupons and thought the fabrics looked pretty together so I picked up three yards of black lace and four yards of point d’esprit netting. I also ended up buying shoes to match the lace before actually making the dress, so those are pictured below as well. I had some black cotton sateen, ivory shantung (leftover from my Royal Milk Tea costume), and quilters cotton laying around as well. The material costs on this dress were pretty low so I splurged and ordered four hundred swarovski crystals in the color “jet”. Now I had my materials, but I didn’t have a design. 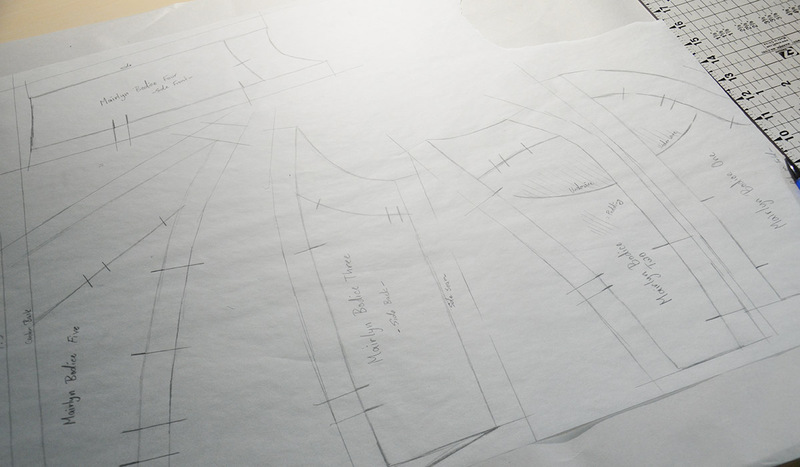 I wanted an A-line silhouette with a structured bodice since I think that flatters me best. I sketched up a simple strapless dress with a lace overlay, which was nice but very boring. The shape of it made me think of vintage dresses from the mid 1900s, so I started browsing pinterest in search of inspiration. Eventually I came across something I really, really, liked. It’s the dress Marilyn Monroe wore to the oscars in 1951. I think it’s beautiful. I wanted to make something really similar to it, as in identical but with a shorter hem and contrasting fabrics. I titled my progress folder “Mairlyn” because of that. But things really didn’t go as planned. I made some decisions which took the design in a different direction, and my materials were way stiffer and more opaque which prevented the airy ruched collar. So my dress looks nothing like this one, at all, but I still love this dress and wanted to share it because look at it. It’s so pretty. 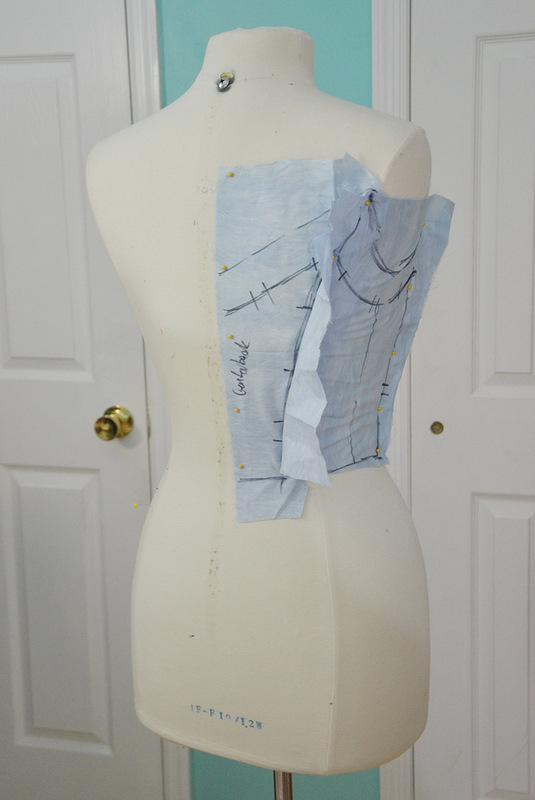 Step one was draping the bodice. One of my favorite details about the dress I used for inspiration is the illusion neckline created with flesh toned fabric. I figured I could do something similar, which is why there is a line about an inch away from the edge around the bodice neckline. 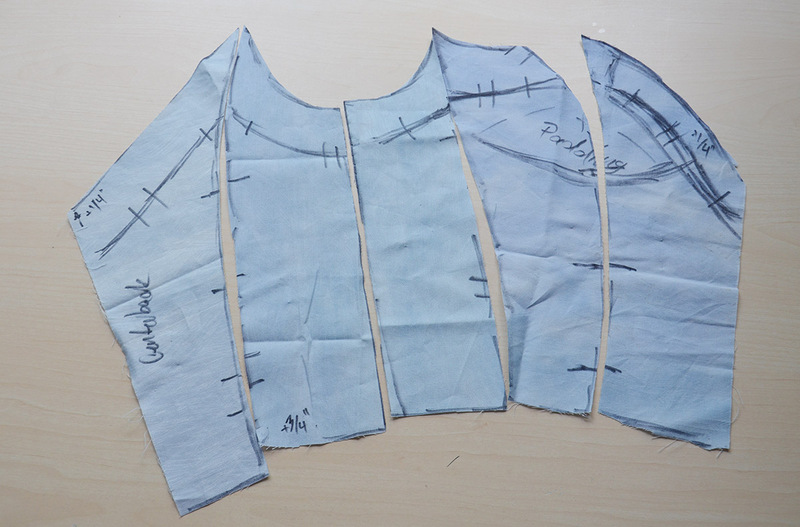 I wanted this bodice to be really structured so I cut it into several different pieces which allows me to add boning into the seams. 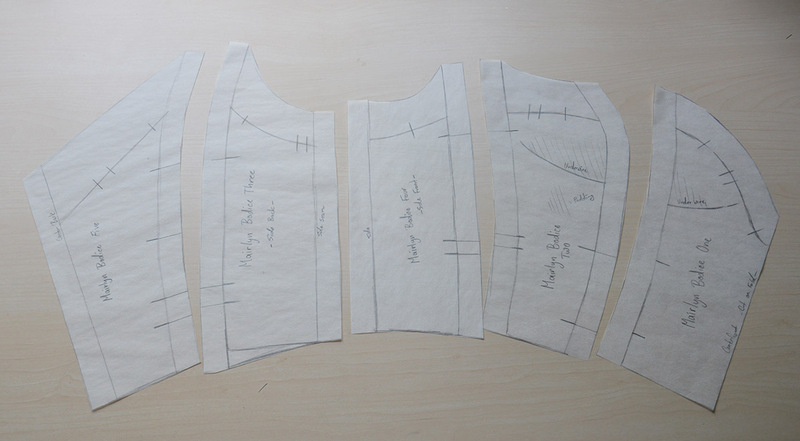 I copied all the pieces onto tracing paper and added seam allowances so I could assemble my first mock up. Here is the fabric after being removed from the dress form. And the pattern it got turned into. I made my first mock up and it went really well. So well that I decided not to bother making another mock up. I regret this decision because I think the finished bodice would fit a lot better if I had made a second mockup and did a test run with the boning. Since my mock up didn’t have boning in the bra cups they slouched down a bit and made the neckline look a lot deeper than it actually was. Because the neckline was lower than I expected I decided to remove the illusion neckline aspect of the bodice. It was revealing enough without that, and even though it wouldn’t cause more skin to show it would hint at it, and I didn’t think that was necessary. So I made some pattern alterations and added more seam allowance. Now I had a pattern that looked like this! 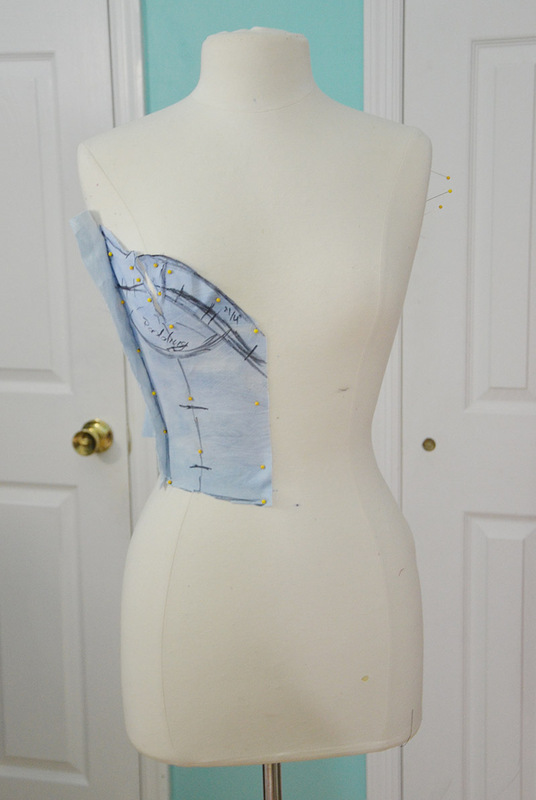 Like most structured bodices this will be made up of three layers. The top layer is made from the fashion fabrics, the base layer where boning and structure is placed, and the final layer is lining to hide anything ugly on the interior. I started by making the base layer. Since the top layer will be stiff I didn’t want to add bulk by having a base layer made from heavy materials. So I chose a medium weight quilters cotton. All the boning channels will be backed with canvas and it will be stitched directly to the top layer of fabric so i’m not worried about it stretching or warping overtime, even though it is a lighter fabric than what would usually be used as a base. I cut all the pieces out and marked the boning channels. Then they were sewn together with three quarter inch seams. I clipped the bust seams just below the line where underwire will be added, then I turned the seam allowance inward and pinned them down. Once these are sewn I will have boning channels I can feed plastic boning into. 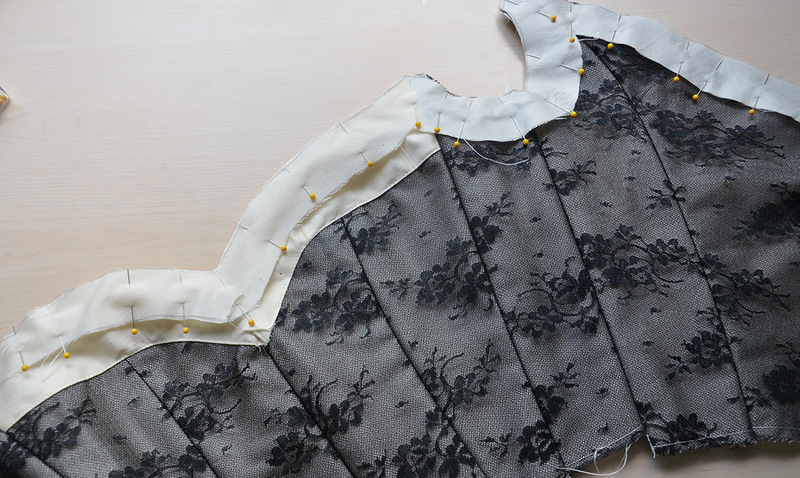 Plastic boning won’t compress the bust, but it will prevent the fabric from turning over or collapsing down, which happens a lot on strapless bodices if you have a small bust. Then I created the rest of the boning channels. 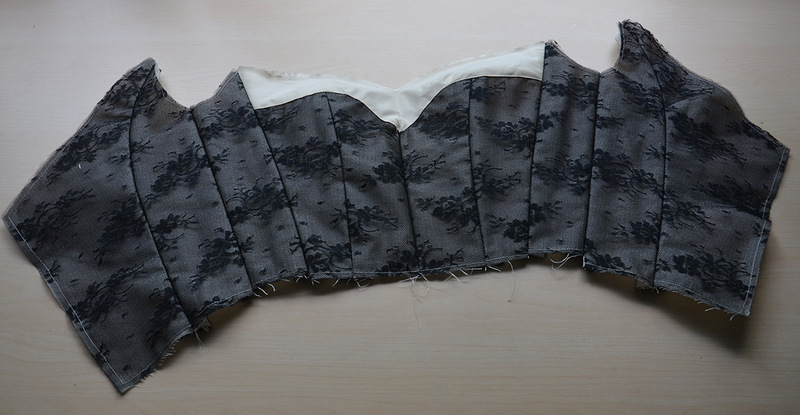 I used spiral steel boning and bias tape to create underwire beneath the bust. Ribbon backed with canvas was sewn on to create channels for the really thick, stiff, steel bones. Some seams were folded inward to create channels for the flimsier bones, which are either plastic or spiral steel. 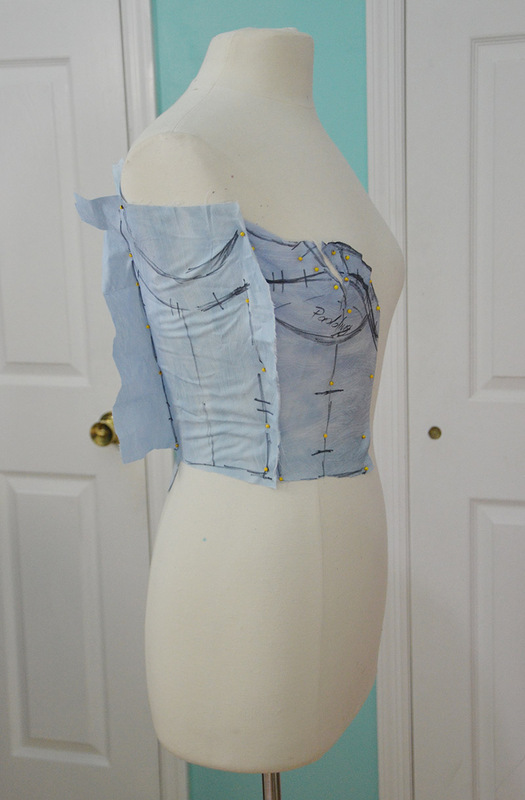 Here the bodice is with all the bones added and the bra cups pinned in. 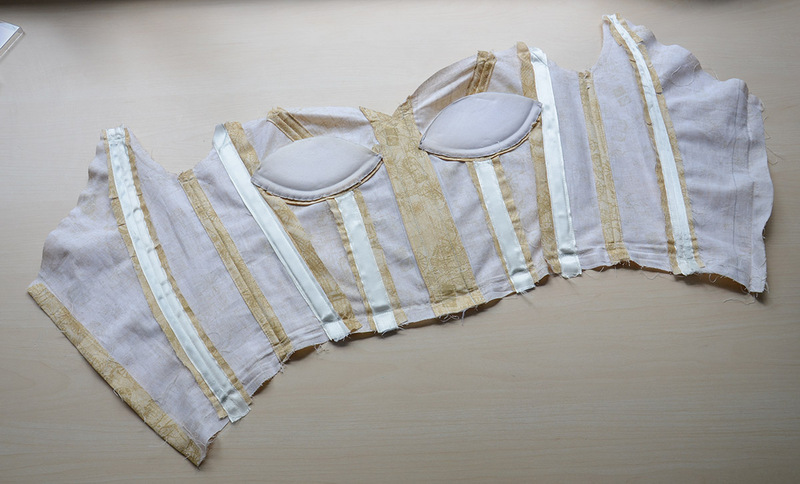 These were bra cups I bought for my Royal Milk Tea costume ages ago – I threw that costume away a long time ago but salvaged the trims, boning, and notions. When I installed these in that costume I had no clue how to draft a bodice to fit them, or how to sew them in. 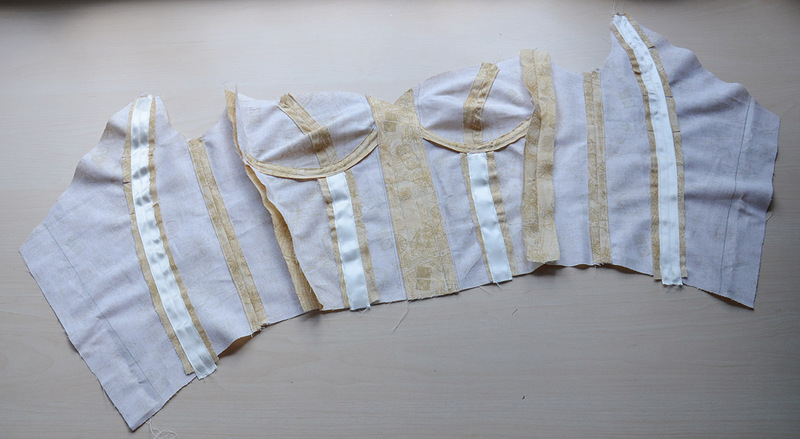 They ended up being really uneven and that bodice gaped horribly at the neckline, you see straight down it. Those were bad times. But i’ve learned a lot since then, and this time they got sewn in properly! Here is how the base layer looked when I tried it on. I was so ridiculously pleased with this fit. There was a bit of warped boning in the back – this is the fault of a spiral steel bone. This was my first time using spiral steel and i’ve decided it’s pretty damn useless, plastic boning holds its shape better, is easier to move in, and a lot easier to install. Aside from that, I thought this looked pretty great. Here it is laid flat. The underwire doesn’t look great here, but it sits smoothly against the body when it’s worn. There were a couple things I noticed during the fitting. The first was that the neckline was way higher (like, a whole inch higher) than I was expecting. As I said earlier, this is because my mock up didn’t have boning in it so it slouched down. With the boning holding the material up it sits much higher on the body. This is good and bad. It means the neckline is high enough for me to feel comfortable adding the illusion neckline back in (yay!) but I think the neckline is a little bit too high. If I ever use this pattern again I would chop a half inch off. The other thing is that it’s slightly too long in the waist. By maybe a quarter inch. Which means it digs into my hips a little. But this dress will be worn over petticoats, which should provide a bit of padding and prevent anything from bruising or bleeding (I hope). 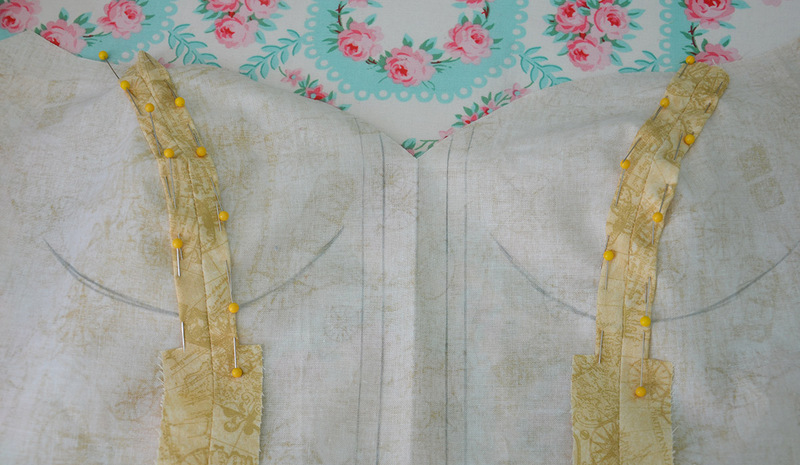 Since the illusion neckline is back I made a quick alteration to the two front panels of my bodice. On the left you can see the original pattern, and on the right you can see the altered version. 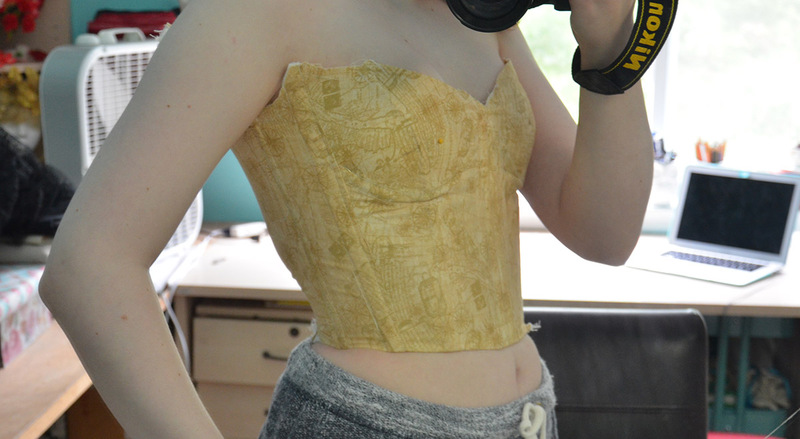 Finally we are onto the top layer of the bodice! I cut everything out from polyester shantung, then pinned two layers of petticoat net overtop. I didn’t like how bright the ivory was beneath the black lace, this helps dull that a bit. …And now we skip a few steps! 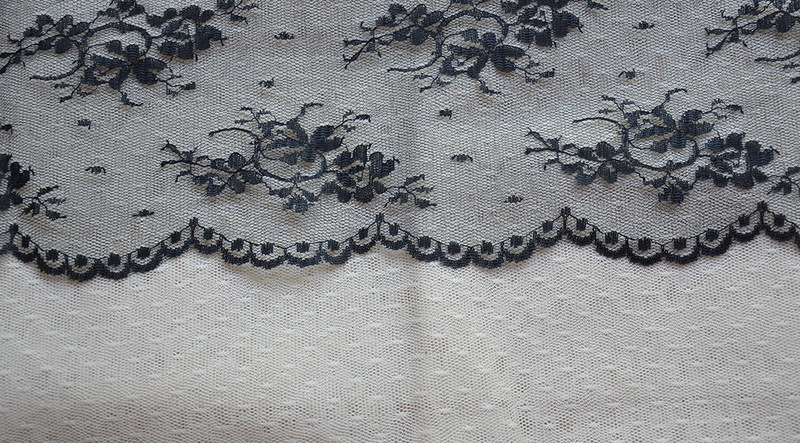 I sewed the netting overtop of the shantung, then basted a layer of lace on top. The only panels that didn’t get an overlay are the top pieces of the front panels. I left this material plain so it would better match my skin tone. All the pieces got sewn together with three quarter inch seams. I didn’t do the smoothest job on those curvy seams at the bust, but that’ll be hidden by the collar so it’s okay. 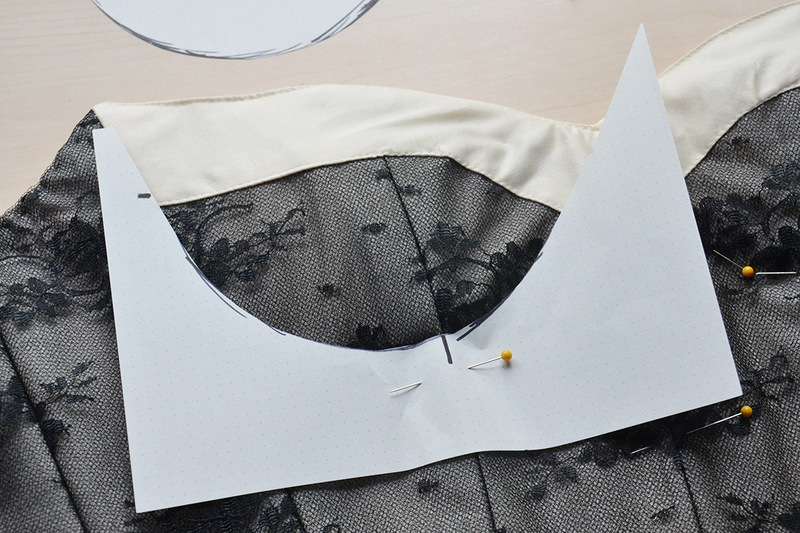 I traced around the neckline and measured an inch and a half away from the traced line, this created a facing which got sewn onto the right side of the bodice. I turned the facing over and sewed it down to get a finished edge. I tucked the base layer between the facing and top layer of fabric, then stitched it to the facing. To further secure the base layer in place I sewed the lower edge of the top layer to the base layer and turned them over to get a finished edge. I hope that paragraph makes at least a little bit of sense. I created a paper guide for where topstitching should be around the bust. 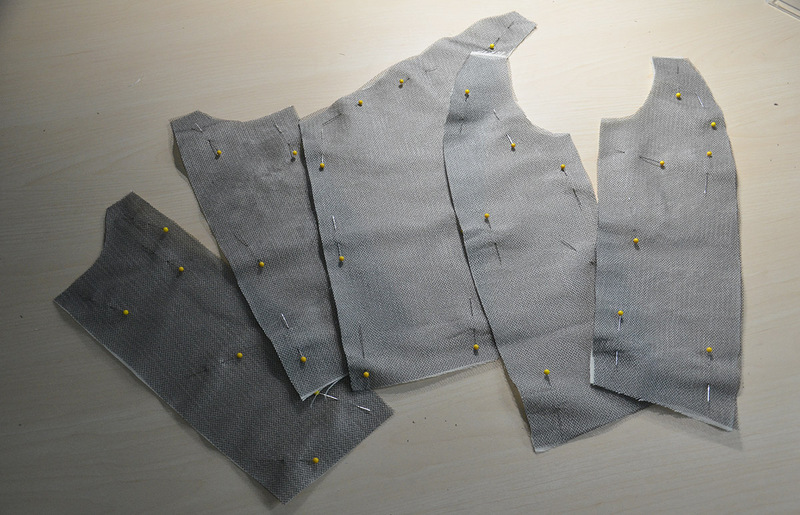 I used pins as a guideline and carefully stitched across them by hand to secure the two layers together. When it came to actually trying on the bodice I ran into a little problem. It wasn’t too small, but it was too small to zip up (there is totally a difference). If I added a lace up back it would have been fine, but I didn’t want to do that. 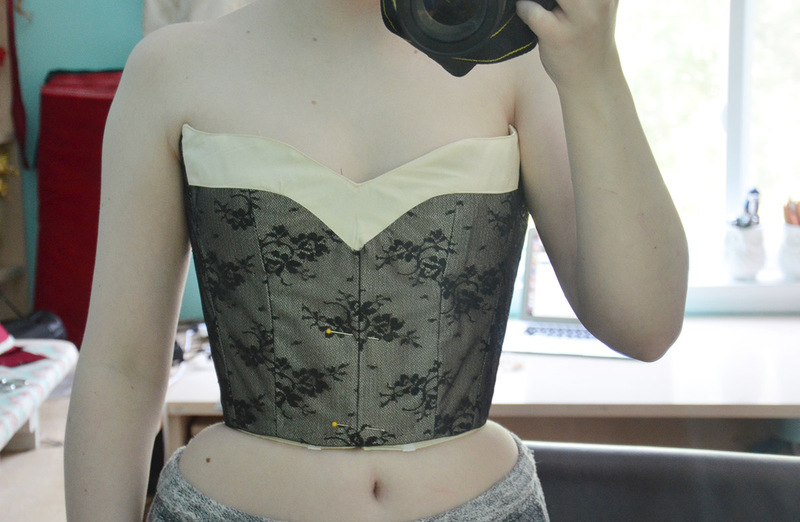 I tried adding extensions onto the back of the bodice but then it was too big and the boning gaped away from my body. Finally I figured out a solution: Make a little girdle/waistband thing that goes on before the bodice to cinch my waist in, then zip the bodice up. To do that I quilted a piece of shantung and backed it with cotton. Then I sewed in plastic boning so it wouldn’t scrunch up. Hooks/eyes were stitched into the front with upholstery thread to create a closure. It leaves behind some pretty ugly marks, but it worked really well! The bodice zips up nicely. Does it kind of painfully dig into my hips? Yup. Will the petticoats help pad that? I really hope so. Even if it doesn’t I should be fine, it doesn’t restrict or alter my breathing in anyway so it isn’t dangerous, it’s just uncomfortable and might leave behind some bruises. I wish I could change a few things to make it fit better (like go back in time and make another mock up… ) but at this point those would be MAJOR changes, and I only have a few days left to get this project finished. So i’m leaving it this way for now, and i’ll suffer through for the sake of looking pretty. 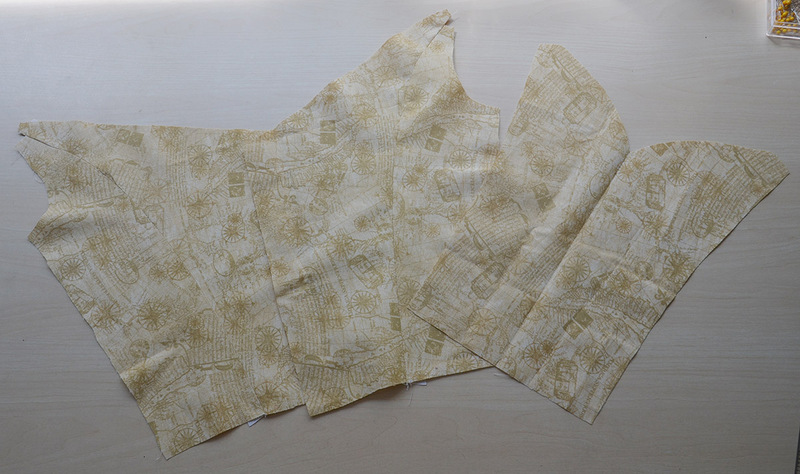 I think that’s it for the bodice – the skirt, collar, and other good stuff will be coming up next week. Also I vlogged throughout the whole process. If you would like to hear me ramble on about my thoughts on this project as I make it, you can watch the videos here! Remember…you are not suppose to outshine the bride. This dress just might do that! But it will only have 400 rhinestones on it! And I won’t be making a matching headpiece. It’s very subdued. Oh my, the bodice is beautiful but looks terribly painful!! It might be a very long night wearing something that restricting. I enjoy reading your blog- very interesting. Thanks Angela. 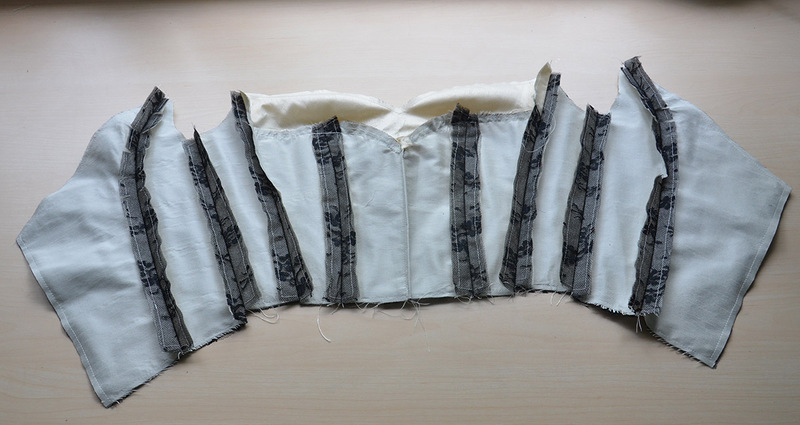 I think it will be okay, the petticoat should do a good job of padding things and I can wear a slip beneath the girdle/waistband to avoid most of the marks. I’ve worn worse for longer periods of time back when I was cosplaying. I’ll pick a day before the wedding and wear it for an hour or two just to make sure it’s fine. This dress will look fabulous!! 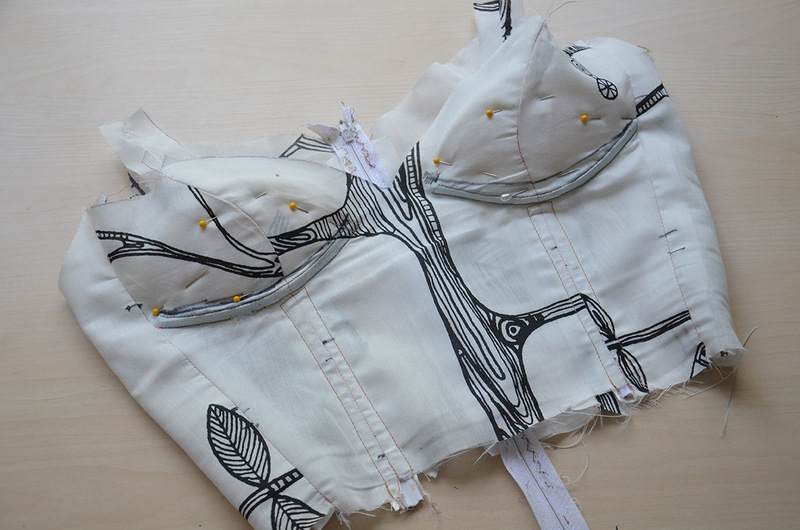 The little cincher you made to get the zip to close could also be attached like a waist stay. I don’t know how many 50s dresses you’ve seen the inside of, but the couture ones that were so tight around the waist usually had a stay made of grosgrain ribbon, which was stitched to the bodice only at the waist seams and the front. There would be little hooks and a closure at the back near the zip and you would do that up first, pulling your waist in and then do the zip up. Also it helped prevent delicate fabrics from having too much stress in the area, as well as stop heavy skirts pulling the waistline out of shape, as the ribbon is doing all the hard work. You need to get the good grosgrain stuff made of rayon or silk, not the cheap stuff that’s easier to find which is actually petersham not grosgrain (or vice versa!! There is a difference). Looking forward to seeing the finished outfit!! I am really looking forward to seeing the whole thing complete! (And I’m saving that Marilyn photo for myself) But I ditto the others in that it looks awfully painful. How much of the waist are you taking in? Would it be possible to purchase some sort of waist cincher to help distribute some of the pressure? I also suggest you don’t give up on spiral steel boning just yet. I’ve only used it once, but I love the stuff! It gives great comfy curves and a tiny waist. But you can’t use it for the lacing boning. You still need to stick with spring steel or something for that to keep an even gap. You make it look so easy! 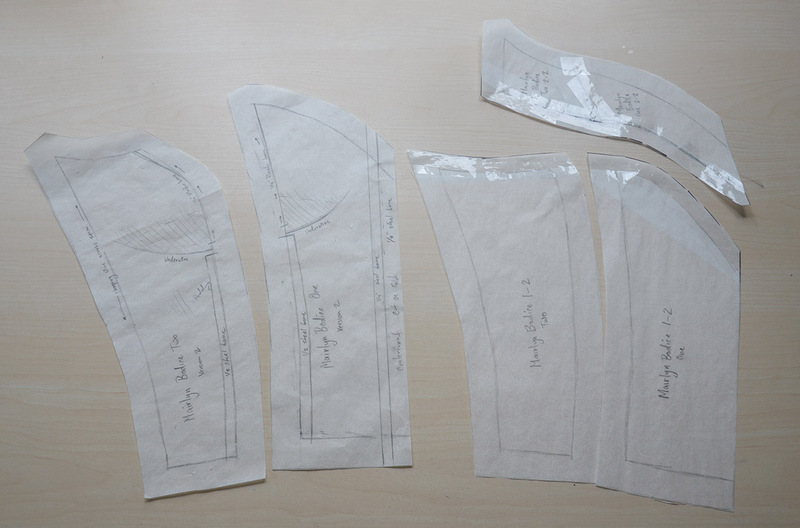 Pattern making is so frustrating for me right now! Thank you for your comments about the boning. 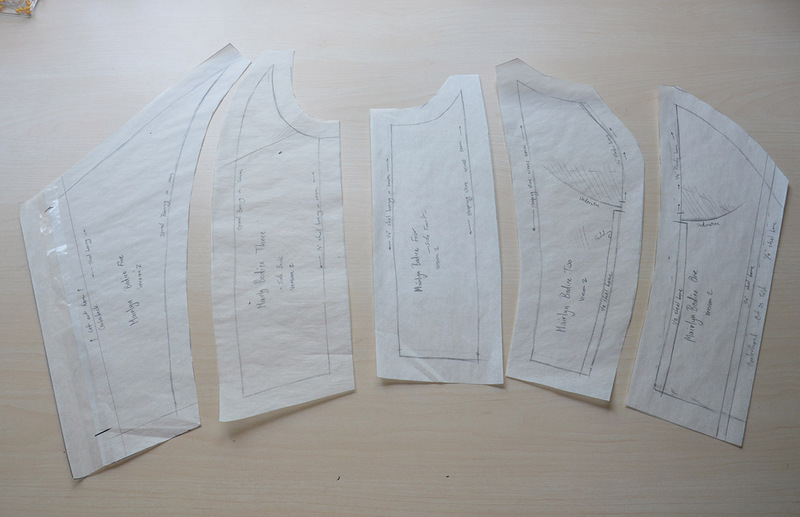 I’m hoping to use boning (for the first time) for a party dress I’ll be making later this year. I had been leaning towards spiral boning because many of my friends who wear corsets love that it doesn’t get bent by the pressure of being worn. But I think for a dress the flat boning will work fine (after all, the flat boning is the kind used in pretty much all dresses with boning). Hearing that it’s easier to use has just further sold me on flat boning. I Don’t know if someone has asked this before, but where do you buy your plastic boning from? I’ve been trying to buy it on-line but haven’t been able to find one with good quality. is there any store that you recommend?